Relaxation for Health: This is the one program that makes it easy to "go to healthTM." Part I Three ingredients to staying in or attaining excellent health. Do you know what to do to minimize your chances of acquiring Alzheimer's disease and what the newest thinking is about what causes it? This cd has the newest thinking and developments concerning Alzheimer's. Part I provides invaluable information on how to hydrate, alkalize, cleanse, and feed your body nutritionally and provides recommended brands that can be purchased at any health food store--all brands are not created equal. Exercise: This CD directs you to the most effective form of exercising available. An exercise that affects every cell of your body and you only need to do it a few minutes a day to experience the equivalent of jogging for miles. This exercise is gentle on your joints and builds and strengthens every muscle in your body. And what's more, the device can be purchased for around $30 from most athletic supply stores or on ebay. Feeding your mind. "I am a healthy person" is an excellent affirmation. But, most people reject it because they collect evidence about themselves and say, "but I have a terrible diagnosis," or "I have this disease the no one understands," or "I feel sick." This program gives your the means (the secret) to truly contemplate health and the path to get you there by using your own negativity to get you there. 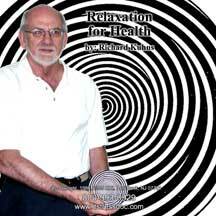 Part II is the relaxation hypnoidal portion of the program, complete with a cleansing technique and subliminal suggestions, takes you to the contemplation of excellent health and along with a post hypnotic suggestion that makes it easier and easier to make healthful choices so that you can "go to health"
Value: What is it worth to continue with your present state of health and psychological wellness or to make sure that you are doing everything possible to get you to health? Millions if you had it at your disposal? You'll find this cd invaluable.